If your heating bills have reached the point that you are considering jumping ship and moving to the tropics, don’t give up just yet. Several new energy efficient solutions have recently become viable, cost-effective options to dramatically decrease your energy bills, as well as the overall comfort of your home or office. For our customers who have been considering switching their existing HVAC systems, we encourage you to learn more about the newest innovations that allow for maximum installation flexibility and design. When it comes to exceptional versatility, heating and cooling power, as well as energy efficiency, it is hard to find a system that is more user-friendly than a ductless mini-split climate control system. During periods of extreme heat and cold, many of our customers face the dilemma of whether to suffer from poor indoor climate control or spend more than they can comfortably afford in order to maintain a comfortable interior temperature. With a ductless mini-split system, you will no longer have to sacrifice your health or your budget. Many of our customers simply do not have available space or the time to have their homes gutted to retrofit their house with the new heating and/or cooling system that is required. 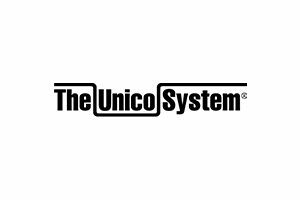 Unico is the optimal solution for our customers whose existing homes cannot accommodate a conventional climate control system. The entire, powerful Unico System can be installed via small, flexible, wall-mounted outlets that blend in with your home’s existing design with little to no remodeling involved. This system is highly energy efficient, can be stained or painted to blend in with any décor, and it also removes substantially more humidity than traditional systems. 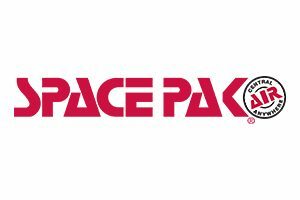 Spacepak has been a customer favorite for heating and cooling system retrofits since we first started installing this system. The comprehensive climate control system has been a part of environmentally conscious building designs for over fifteen years. The units are designed with narrow-gauge supply lines that can be easily placed within walls and ceilings, similar to electrical lines. The outlets, which are small circular discs, are the only visible part of the system. These can be installed on walls, ceilings, or floors, and are easily customized to match your existing design scheme. 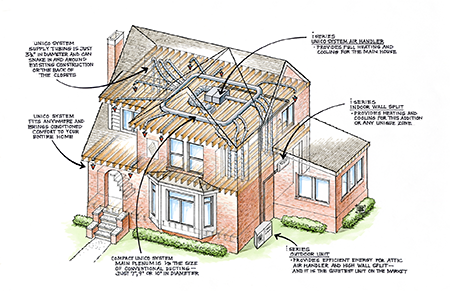 Contact us to request a quote or schedule a consultation to discuss your residential or commercial retrofit project. Call: (304) 623-0606.